Semiconductor Research Corporation, the world’s leading university-research consortium for semiconductor technologies, has awarded $103 million to Georgia Institute of Technology during more than 30 years of supporting research at the university. 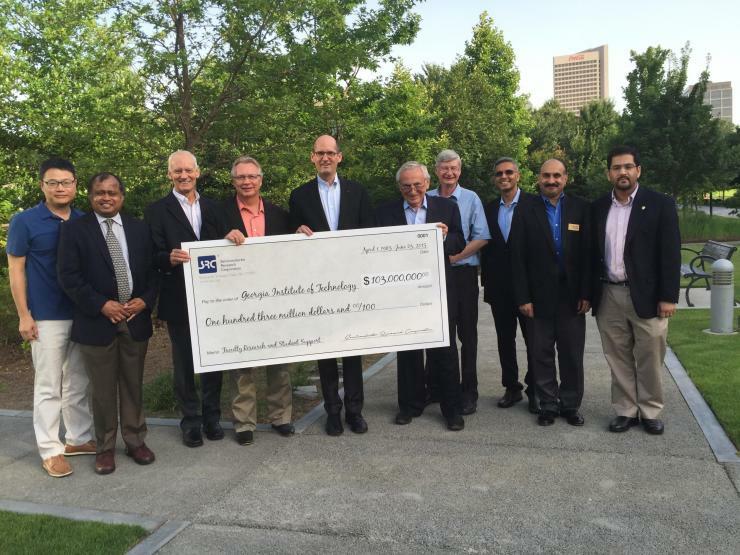 Georgia Tech recently inducted SRC into the Hill Society for sponsoring research grants, contracts, and fellowships since 1983. SRC’s support of faculty- and student-led research at Georgia Tech has produced key research findings in areas such as mixed-signal integrated circuits, silicon germanium BiCMOS technology, RF design, system-on-a-chip, multi-core architectures, 3D integrated circuits integration and CAD, post-CMOS spintronic interconnects, packaging technologies, and CMOS multi-modality sensing platforms for chemical detection and drug development. Forty-four patents have been issued to Georgia Tech faculty based on SRC research, and 95 graduate students and 12 post-docs have been supported by SRC funds. Many of these students have gone on to work at SRC member companies after graduating from Georgia Tech. “SRC has enjoyed a tremendous and productive relationship with Georgia Tech for more than 30 years, and we’re pleased to receive recognition from the university as we collectively salute this collaborative effort of advancing technology,” said Ken Hansen, SRC president and CEO. The SRC-Georgia Tech partnership involves several research programs, including SRC’s Global Research Collaboration (GRC), STARnet, the Nanotechnology Research Initiative (NRI) and the SRC Education Alliance (SCREA). Other notable contributions include Professor Emeritus Jim Meindl’s projects on gigascale integration and the Center for Advanced Interconnect Science and Technology. Meindl and Regents’ Professor Paul Kohl, of the Georgia Tech School of Electrical and Computer Engineering (ECE) and the School of Chemical and Biomolecular Engineering respectively, also acquired almost $81 million in funding from the joint DARPA/SRC-funded Microelectronics Advanced Research Corporation for the SRC Interconnect Focus Center (IFC) from 1998 to 2012. Additionally, SRC funding of $2.4 million established the Interconnect and Packaging Center (IPC) as an SRC Center of Excellence at Georgia Tech in 2009 for research focused on 3D technologies leading to 3D IC technology innovation, exploration, and discoveries. ECE Professors Madhavan Swaminathan, Sung Kyu Lim, and Muhannad Bakir presented updates on their SRC-funded research during the induction ceremony. Bakir, a former SRC student and current SRC-funded faculty, said he is proud to have been a part of the SRC community for the past 15 years. In addition, Georgia Tech hosted SRC’s summer strategy session and board retreat. The session brought leaders from the semiconductor industry and research universities across the country together to discuss three upcoming areas of research focus: Semiconductor Synthetic Biology, the Innovative and Intelligent Internet of Things, and Efficiency and Performance for Connectivity Constrained Computing. “We look forward to many years of continuing our research partnerships with SRC and especially supporting the new areas of focus that have been identified as the future of the semiconductor industry by experts from the field,” said Steven W. McLaughlin, ECE’s Steve W. Chaddick School Chair.